Hard Cover System - Manufacturer of index cutting machine, book binding machine in Kattivakkam, Tamil Nadu. 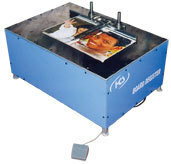 Star is a versatile, semi - automatic index cutting machine. The book is clamped by the spring. The process of counting the sheet is handled by the operating person. The automatic punching process is programmable and follows the counting process as a parallel procedure. The standard machine is suited for Gluing paper, goods in blanks of every description. It is normally supplied with Motor, but it can also be operate by hand. Gluing Machine with bottom gluing unit working widths up to 350, 500, 650 & 800mm wide for cold, hot glue for full service and strip gluing for paper. Glue wheels mounted on a shaft are available for applying glue strips. The glue wheels are available in various widths and can be shifted on the carrier shafts as required.